Hello, boys and girls. Today I want us to take a journey right through the center of the sea. There is no need for raincoats, because we aren't even going to get wet. We're not even going to need a boat for this trip. We are going to walk right through the center of the Red Sea. Our story today is about FAITH and how with just a small amount of faith, the Lord will guide us through even the biggest of problems. Our leader is going to be a man named Moses. He is the leader that the Lord wanted to take the Israelites out of a town called Egypt. We are going to be traveling with him and the Israelites as they leave the town of Egypt. Moses has spent a lot of time talking to the Lord and getting his directions for this journey. 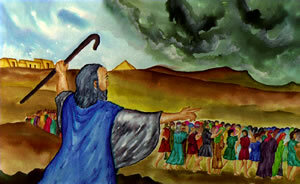 The cloud that we are seeing, the Lord has provided the Israelites to lead them by day. This is a promise that the Lord gave Moses and the Israelites, to show that He is with them at all times. The Lord also gave them a fire by night that also lets them know that He is with them all day and all night. The Lord loves them very much and wants to protect them from danger. King Pharaoh is a very mean king and wants the Israelites to stay because they worked very hard and made him a lot of money. The only problem is, that they did not get very much money to live on and the Lord did not like to see His people suffer. The Lord has made a very tricky plan for Moses and the Israelites. Let's see just what the Lord has planned for this journey. The Lord has told Moses that He wants the Egyptians to think that we are confused so King Pharaoh will chase us and try to capture us. He told Moses this so that He can show Pharaoh and the Israelites just how powerful He really is. I don't know about you , but I'm a little scared right now. Aren't you? I don't think I want to be chased by this king named Pharaoh. He sounds like he could be very mean, when he wants to be. Moses doesn't seem to be scared. He is sure this will work. Oh no! Here comes the Egyptians. There must be hundreds of them. Just look at those big horses and those chariots. Listen, the Israelites are telling Moses that they don't understand how he could lead them into such a big mess. I want to go and hide. Don't you? Moses told them to just stand still. I don't understand. I certainly see them. They are coming right toward us. We must have FAITH. The Lord did tell Moses that He would look after the Israelites and keep them safe. Let's see what Moses is going to do. Moses is talking. He has told the Israelites not to be afraid. He said to just watch the Lord get them out of this mess they are in right now. Moses told them that they would never see those Egyptians again. I'm not sure how that is going to be, but let's just wait and see. Everybody together with us. This is going to be very exciting and I don't want anyone to miss a single minute of this adventure. Moses is talking with the Lord and it seems that the Lord has told him to raise his staff over the sea and it will divide right down the middle. Then we can cross over to the other side on dry land. See, I told you we would not get wet or need a boat! See, Moses is raising his staff and the wind is beginning to blow. We must stay here all night according to Moses. Did everyone sleep good last night? I sure did. Today is going to be a really exciting day. Look the ground is dry and the water is standing on both sides of the dry ground. This is awesome! We are going across now. I hope this is the last time that we see those Egyptians. Look, here comes the Egyptians. Look at the wheels on their chariots. They are twisted and falling off their chariots. Oh no, they are in the middle of the sea and they can't go anywhere. Their wheels are all off their chariots. Did you hear what they said? 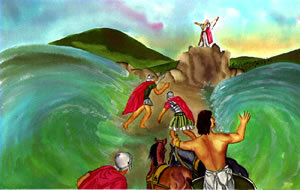 They said they needed to get out of there, that the Lord was fighting against them and for the Israelites. They are scarred to death. I'm glad we are all over here on the other side. Are all of you here with me? I wouldn't want anyone to be left behind. The Lord has told Moses to raise his staff so that the waters will all go back to the way they were. Oh, those pour soldiers. They are all going to be killed. But we are fine and the Israelites are all saved just as the Lord said He would do for them. The Lord did keep His promise to the Israelites just as He said He would. He'll do the same for you. I hope this Bible story about Moses has taught you that if you will just let the Lord have your life and let Him lead you in your life everyday, that no matter what happens, He is there for you and will take very good care of you. The Lord loves you so much and only wants what is best for you and your family. We can learn more about the Lord by reading our Bibles and praying to Him everyday. The Lord loves to hear from children. He wants to know everything that is on your heart, good or bad. He loves to hear about your day. There is nothing that you can't tell the Lord. By the way, He already knows, He just wants you to tell Him yourself because He loves you so much and wants to spend time with you. Here are a couple of bible verses that can help you to have FAITH in the Lord. A question that you may ask is Would the Lord do something like that for me? I'm just one person. The answer is YES!!! The Lord loves you with all His heart and wants you to be safe with Him always. Just pray to Him and ask Him. He is always there for you night or day.